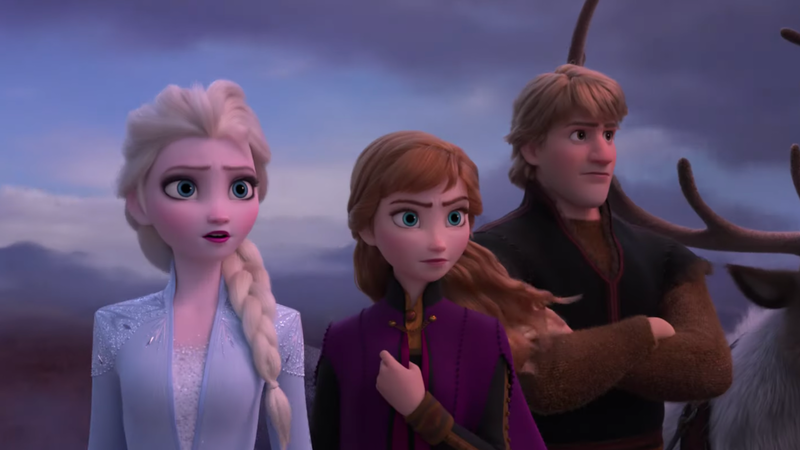 Disney has released the first teaser trailer for Frozen 2 bringing back Elsa, Anna, Olaf, and Kristoff in an adventure way outside the chilly comforts of Arendelle. Also, there's ice surfing. The highly anticipated sequel to 2013's Frozen brings back Kristen Bell and Idina Menzel as Anna and Elsa, two sisters who were torn apart after Elsa's icy gifts were exposed to the world … only to be brought back together through love. According to the synopsis, in this latest film Queen Elsa and her sister will embark on an adventure that takes them to another land, far from the kingdom of Arendelle. Here's a look at the official teaser poster. It's unclear what adventures lay in front of the sisters and their friends. But I'm wondering if it has to do with finding people with gifts like Elsa's-given how we get a glimpse of a new character out in the leaf-covered wilderness. Let's just hope it does not involve any more of Olaf's frozen adventures.